Sumber berharga bagi Anda dan keluarga untuk mempelajari dan memahami tubuh manusia dan apa yang diperlukan agar tetap sehat. 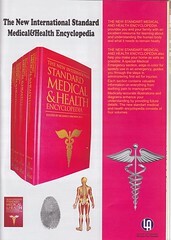 The New Standard Medical And Health Encyclopedia provides you and your family with an excellent resourse for learning about and understanding the human body and what it needs to remain healthy. The New Standard Medical And Health Encyclopedia also help you make your home as safe as possible. A special Medical Emergency section, edge in color for speedy use in an emergency, guides you through the steps in administering first aid for injuries. Each section contain valuable information on everything from teething pain to mamograms. Medically-accurate illustrations and diagrams enhance your understanding by providing future details. 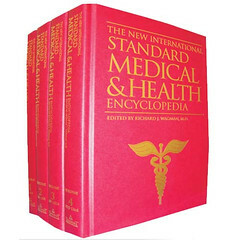 The New Standard Medical And HealthEncyclopedia consists of your volumes.